Admittedly, I have a distinct penchant for films that clamored out of the turbulent 1970s. Even more so for those of the crime variety that may have rattled some, even while they entertained those of us who were lucky to catch them first-run. One such forgotten gem, which recently Kino Lorber brought back to high-definition glory, was Michael Ritchie’s Prime Cut (1972). A poetically violent Midwest tale of misdeeds with enough off-beat humor and style that helped define what was unique about this era of cinema in the first place. The film contained not only a cast of movie titans, including Lee Marvin at his coolest, Gene Hackman chewing scenes as only he can, along with Sissy Spacek’s superbly ethereal cinematic debut, but featured another captivating opening title sequence. Main titles that essentially set in motion the story’s nasty rivalry between big city Chicago and their Kansas City crime cohorts. With murder and meat processing part and parcel of the opening salvo aimed at the audience. What can I say, it was the ’70s. The sequence follows “Weenie”, the brother-henchman of “Mary Ann” (Gene Hackman), the late and wonderful character actor Gregory Walcott, as he “processes” his opposite number through their Midwest slaughterhouse. A fascinating, even if it’s a bit off-putting (well enough to make one go vegan), segment of how frankfurters are made, with unforeseen ingredients. From whole cow to finished product, all as the bold titles move laterally across the screen and are cut in two…to a bone-trimming sound effect. The warning sign over the slaughterhouse entrance part of the tongue-in-cheek humor of “Prime Cut”. The wickedly trenchant title sequence a pluperfect onset to Michael Ritchie’s satirical ’70s mayhem that made the crime and corruption depicted on the wheat-strewn homeland as American as county fairs, apple pie, and of course, hot dogs. I am sure I saw this but it was over 30 years ago and I just can;t really recall anything now – sounds great Michael. Great review! Wow. Gene and Lee. How did I miss this? This is a true forgotten gem, Cindy. The new blu-ray shows it off pretty well, too. Many thanks! Luckily I’d just finished eating my lunch of Cabannosi sausage when I saw your post in my reader. I always enjoy Prime Cut’s classic 70’s gritty, crime film style, greasing it’s action with lurid sleaze, and where else can you watch a car get eaten by a combine harvester! Described it to a tee, Paul. Oh, yes. That a wonderful scene that recreates Hitchcock’s cropduster scene from “North by Northwest” with that interesting “climax”. Thanks, my friend. I need to do a post on this film. It definitely has that 70s sleaze vibe. Two of my favorite tough guys and a nasty crime setting, this demands another viewing soon. Couldn’t agree with you more, Richard. 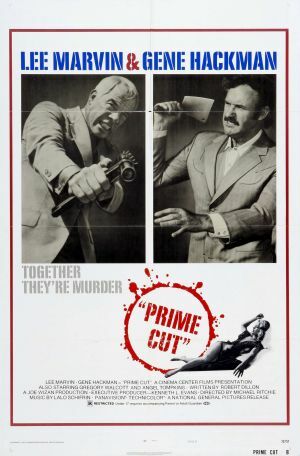 “Prime Cut” is deserving of more scrutiny. The new blu-ray worth obtaining. Thanks, my friend. Of a film I’d seen ago on the Big Screen long ago. Courtesy of Armed Forces Films in Panama. Comes as close to humanly possible in revealing how sausage is made. Away from Capitol Hill. Love the black loafer showing up in mid process. Also a fairly decent Shoot ’em Up! “Guy Flick”. With two of the best Tough Guys of 1970s American cinema as deadly protagonists! Armed Forces Films were kind of hit or miss. For every ‘M*A*S*H’, ‘Hickey & Boggs, ‘Payday’ or ‘Prime Cut’. There was a ‘Truck Turner’, ‘Pete, Pearl and The Pole’ or ‘Danger Man’ to contend with. But air conditioning, popcorn and a Coke beat the heck out of stickily humid nights, any day. Also great to see Hackman playing a ruthless bad guy against and equally ruthless Lee Marvin! Excellent! Not a film I’ve seen, but the titles look like it’s a movie I should try to catch soon. Great cast too!